Try this spiced up Southwestern pizza cooked on your grill! 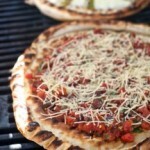 In this recipe we attempt to recreate the wonderful thin-crust pizza from wood-fired ovens in your very own backyard. Our homemade crust has something that Pizza Doodle Express does not: chile. But if you’re lazy and don’t want to make your own dough, you can use a 12-inch, pre-baked pizza shell. You can also easily make the dough in your bread machine. It is very important to have a clean grill for this recipes, as any residue on the grill will give the crust an off flavor. Why not make both toppings and divide the pizza? Brush each of the pizzas with olive oil and gently drape, oil side down on a hot grill. Shortly, within a minute or two, the dough will start to rise and bubbles will appear. Gently lift an end to see that the underside is browned and has grill marks. Immediately invert the crust onto a pan, and turn the gas grill to low.